Healthy meals don't have to be completely homemade. These packaged foods get the green light from top dietitians. While preparing your own meals is always the better and healthier choice, there are plenty of healthy products out there that can help you stick to a nutritious diet, and better yet, help you save time meal prepping. “There are some products out there with loaded ingredient lists that contain a wide range of healthy items, so it’s best to look at quality — not quantity — of ingredients,” Taub-Dix says. With that said, we consulted some of the top dietitians on what healthy convenience foods they love to stock up on and why. If you despise washing and chopping herbs, culinary nutrition expert Jessica Levinson, MS, RDN, CDN, has the ultimate shortcut: Gourmet Garden’s stir-in herb and spice pastes. These pastes last up to three months, and you can add them to salad dressings, stir-fries, marinades and more. “I always have tubes of garlic and ginger in my fridge. They save me so much time from having to grate ginger and garlic myself.” And if you often have wilting herbs in your fridge, Gourmet Garden’s lightly dried herbs imparts the same flavor of fresh ones without having to throw your money away on a bushel. “Another brand, Dorot, also sells trays of frozen herb and spice cubes,” Levinson adds. Preparing your own bone broth is fairly simple, but it takes a bit of time to collect chicken or beef bones, veggie scraps and leftover herbs. Brooke Alpert, MS, RD, CDN, author of The Diet Detox, says, “Just yesterday, I made a soup that called for broth. And while I love making my own bone broth, letting it simmer in my slow cooker for two days clearly wasn’t going to happen. Thank goodness for Epic bone broth!” Epic’s bone broth comes in four delicious flavors, including Beef Jalapeno Sea Salt, Homestyle Savory Chicken and Bison Apple Cider. Because Epic relies on the traditional slow-cooking technique, its broth gets more collagen, nutrients and gelatin from the animal bones. From peanut butter and jelly sandwiches for the kids to your morning avocado toast, bread is one of the most popular pantry staples. But not all whole-grain breads are made alike. 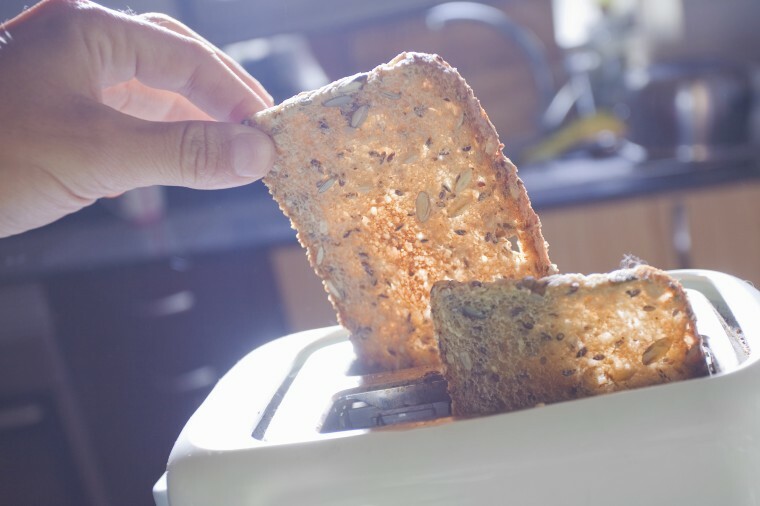 Taub-Dix prefers Dave’s Killer Bread because of its impressive ingredient list, which includes rolled oats, barley, quinoa, amaranth and other whole grains. It also boasts five grams of protein and 260 mg omega-3 fatty acids in every slice. “My favorite flavor is Raisin the Roof (cinnamon raisin bread). It makes an awesome French toast!” Taub-Dix says. Unlike other store-bought salad dressings, which are loaded with sugar and unhealthy fats, Primal Kitchen’s dressings are sugar-, soy- and dairy-free. Plus, they’re certified paleo- and keto-friendly. Celebrity nutritionist Kelly LeVeque goes for Primal Kitchen’s Whole 30-approved dressings because they come in a variety of bold flavors and have wholesome, organic ingredients. “These dressings are made with pure avocado oil instead of oxidizing omega-6-rich polyunsaturated fats, like safflower, sunflower, corn or soybean oil,” she says. We love the balsamic vinaigrette, honey mustard and Caesar dressings the best. Making a salad doesn’t get any easier than throwing Eatsmart veggie kits into a bowl. That’s right, no peeling, slicing, chopping or dicing. And with mixes like Avocado Ranch, Asian Sesame and Strawberry Harvest, you can’t go wrong. Each salad kit features a variety of vegetables, like kale, broccoli, cabbage, carrots and Brussels sprouts. Plus, their 100% Clean Label ensures that their products are free of artificial colors, flavors and preservatives. “Whether I eat these salads as a side or as a foundation for grilled chicken, fish or beans, I love that these veggies still hold their crisp texture and distinctive flavors,” Taub-Dix says. Prepping for pizza night doesn’t have to be an all-day affair, thanks to Trader Joe’s gluten-free cheese pizza with a cauliflower crust. Rachel Paul, RD, says this dish is a staple at her house for busy weeks. The crust features cauliflower, brown rice flour, chickpea flour, mozzarella cheese and potato flour, making it a low-carb alternative to regular pizza. All you have to do is pop it in the oven for 10-12 minutes, and it comes out crispy on the edges and gooey in the middle. When it comes to budget-friendly meal prep, canned foods are the healthy food gift that keeps giving. LeVeque likes Safe Catch’s canned tuna and salmon because they’re sustainably caught and have no additives or fillers. “It’s one of the lowest in mercury, and their cans are safe for pregnant women and children. Salmon is a phenomenal way to increase omega-3 consumption, and Safe Catch makes it easy to whip a salmon salad or warm salmon cake in minutes,” LeVeque says. If you want to impart some heartiness to your salads or smoothies, Ashley Koff, RD, Espira by AVON nutritionist, recommends Nature’s Path Qi’a. “It combines buckwheat, chia and hemp seeds. I love to bring it with me to swap out for croutons and to give some crunch in my smoothies,” she says. And if you’re craving cold cereal, Qi’a Cocoa Coconut Superflakes tastes just like the childhood favorite. Instead of pasta sauce, Paul likes to use Trader Joe’s canned fire-roasted tomatoes to top her noodles. It has zero grams of sugar compared to other store-bought sauces and provides the right amount of spice and flavor you need. “I love to use canned crushed or diced tomatoes instead of tomato sauce to save on calories. It saves more than half the calories and virtually any added sugar,” Paul says. Frozen TV dinners have gotten a bad rap for being processed and not as nutrient-dense, but Dr. Praeger’s frozen food options make healthy eating convenient. Taub-Dix likes their veggie burgers and mac and cheese bowls for her grandson. “These products help kids explore textures and flavors in a healthful way,” she says. Unlike other frozen dinners, Dr. Praeger’s products contain ingredients you recognize, and there are vegetarian and gluten-free options, too. “[The products] have a solid amount of protein, vitamins and minerals, and all the veggies you’d hope your kids would eat!” Taub-Dix says. Want to elevate your cup of joe or cold brew? You might have heard of Califia Farms’ nut milks, which are sustainably made and GMO-free. Koff says their Better Half creamers are an equally great choice. “It’s got a delicious taste and doesn’t have artificial ingredients or hydrogenated oils. I like to drizzle it on top of soups and even salads,” Koff says. There are also unsweetened versions if you’re trying to cut back on sugar. And to make her coffee even more nutrient dense, Koff likes to add Espira Plant Protein Powder. “I carry Espira plant protein powder packets and a shaker cup to quickly and easily upgrade my coffee or tea. Take cold or iced coffee or black tea and mix it with the protein packet and plain, unsweetened non-dairy milk,” she says. Whether you’re cooking chicken noodle soup or a casserole, mirepoix is a ready-to-use blend of carrots, onions and celery. In traditional French cooking, mirepoix is two parts onions, one part carrots and one part celery. Levinson uses Trader Joe’s mirepoix as the base for soups and stews. The beauty of mirepoix, also known as the “holy trinity” in cooking, is it infuses your dish with an aroma of flavors. Consider this product a godsend! The healthier pick: a hot dog or a hamburger?